Lecturer: Daniel Kral (University of Warwick). The theory of combinatorial limits provides analytic tools to represent and analyze large discrete objects. Such tools have found important applications in various areas of computer science and mathematics. They also led to opening new links between algebra, analysis, combinatorics, ergodic theory, group theory and probability theory. During the course, we will focus in more detail on the more understood case of limits of dense structures and the flag algebra method, which changed the landscape of extremal combinatorics. We will also provide a brief overview of results and open problems concerning sparse structures. Daniel Kral is a professor of mathematics and computer science at the University of Warwick. He obtained his Ph.D. from Charles University in Prague in 2004. After short-term positions at TU Berlin, Charles University, and the Georgia Institute of Technology, he returned to Charles University in 2006, and became an associate professor there in 2010. He was awarded the degree of Doctor of Science by the Academy of Sciences of the Czech Republic in 2012, and in the same year moved to a professorship at Warwick. 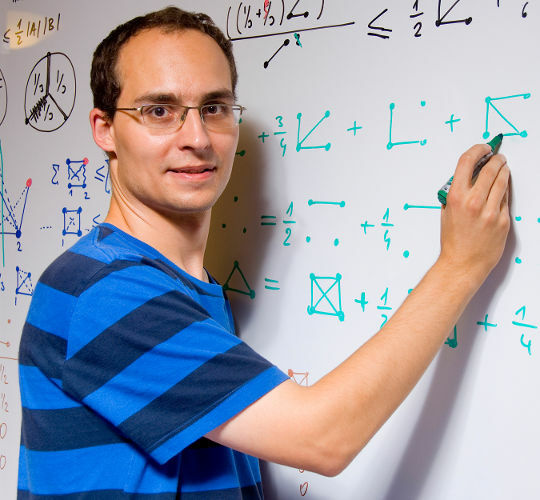 In 2011, Kral won the European Prize in Combinatorics for his work in graph theory, particularly citing his solution to the Plummer-Lovasz conjecture and his results on graph coloring. In 2014, he won a Philip Leverhulme Prize in Mathematics and Statistics. Assignment: problem set. Please submit the solutions at the address szymtor@mimuw.edu.pl by June 6th, with tag [PhDOpen-exam] in the title of the message.